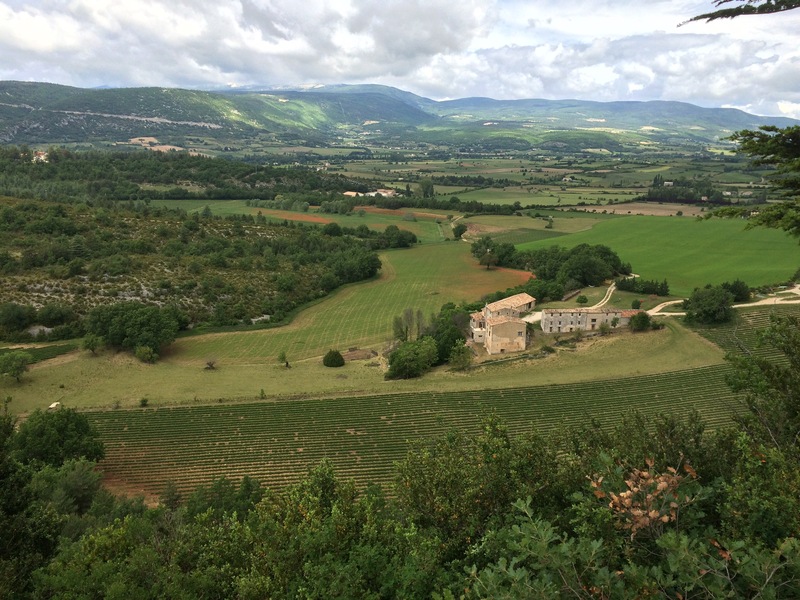 Over the years that we’ve been coming to the Vaucluse we have often ‘popped’ across the hills that sit between the Luberon & Mont Ventoux. This has always been done by car and I’ve seen people on bikes riding it and thought to myself – that’s not for me! That was until yesterday when we woke to blue skies and my hubby & youngest took me on a bike ride (on the roads we have always driven before) across the top to Sault. So far this week we have done other ‘hilly’ rides through some stunning scenery and my hubby happily told me that this one wasn’t as bad as these others ( a comment backed up by others too) – although my memories of red-faced cyclists with their legs whizzing round in the lowest gear possible didn’t really tally with what I was being told. OK there were others I’d seen who seemed to be doing it effortlessly, but they wouldn’t have looked out of place in the Tour De France peloton so I ignored them, imagining myself alongside or probably just behind the others. With that in mind I was a little unsure of whether I would enjoy this ride as we cycled out of the house first thing in the morning. 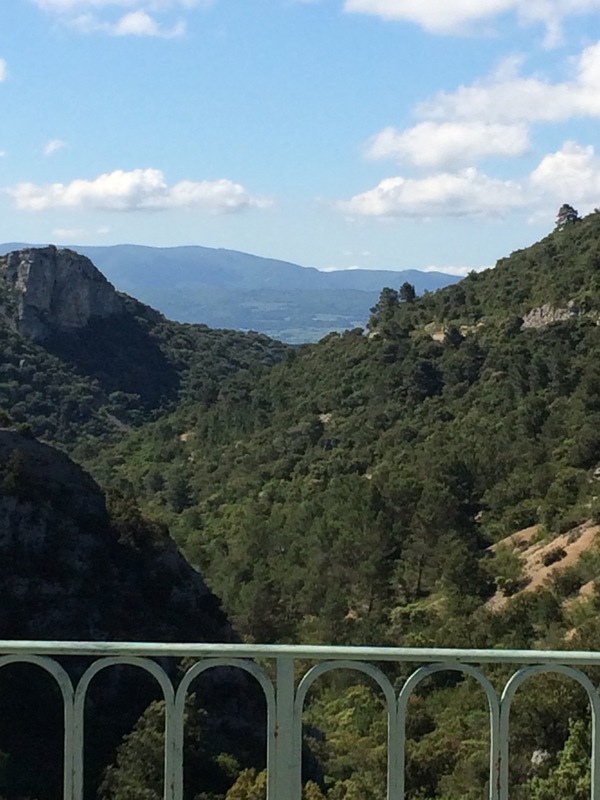 The starting point (as ever) for this ride is the Veloroute du Calavon and we followed that through Apt, turning off (by the swimming pool showroom & shop) onto the road that leads to Saint-Saturnin-les-Apt. This road climbs very gently out of Apt, arriving in the pretty village of Saint Saturnin after a few kilometres. I have to say that this isn’t the quietest of roads, but for a good distance there is a marked lane allowing us & the bikes a bit more space as the cars passed. I’m not sure where all the cars go, but by the time we were snaking up the bends on the final approach to the village we seemed to have the road to ourselves. After a nice breakfast we set off, heading out of the village on the road signposted towards Sault. 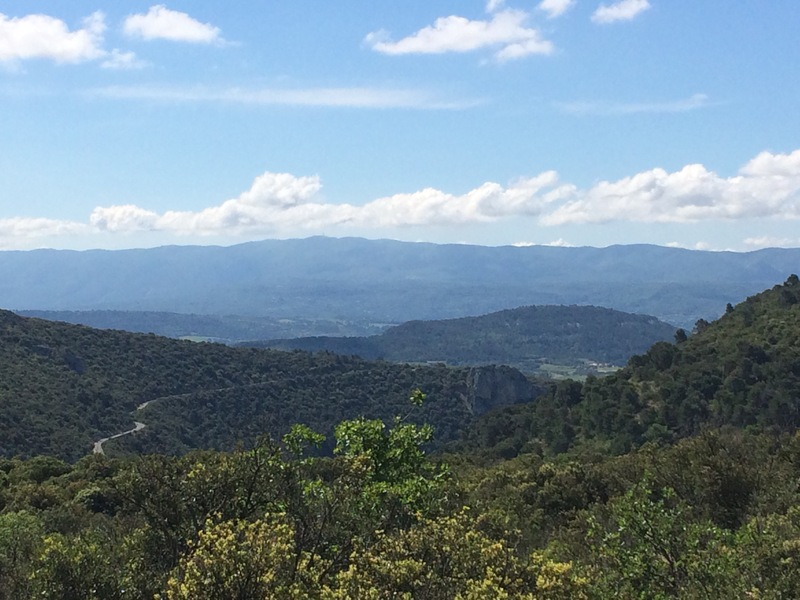 Immediately we lost the traffic & like so many of the roads we have been along it felt as if we had the road to ourselves as we climbed gently, taking in the stunning views of the Luberon & its pretty villages. 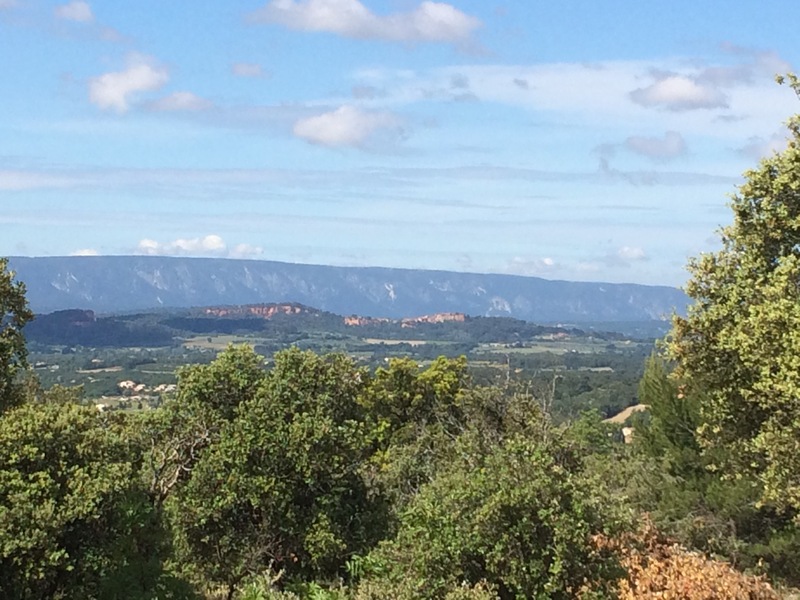 The road then snakes away from the Luberon valley, climbing through a dramatic gorge, before emerging into a more agricultural area with fields of lavender & vines. 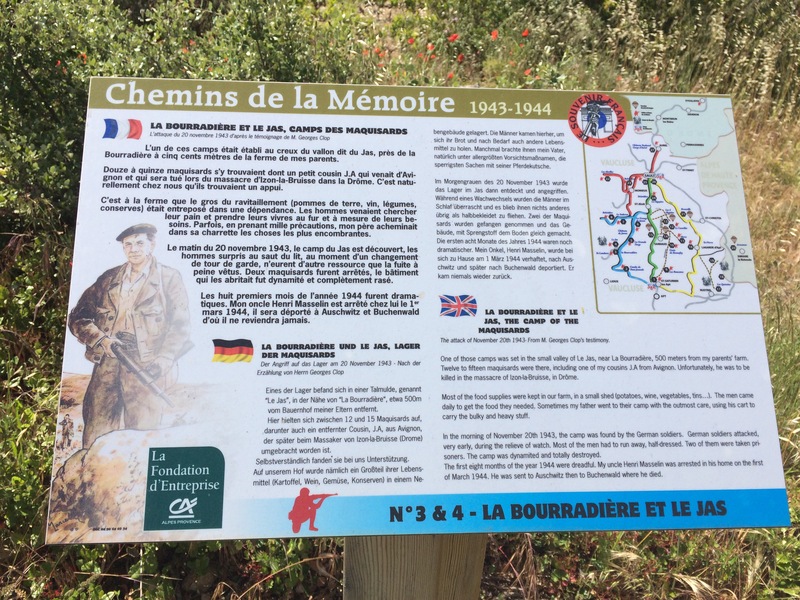 It was here that I first noticed a sign highlighting Resistance activity that had taken place in the area & saw that we had stumbled onto one of the ‘Chemins de la Mémoire’. The signs were written in 3 languages, describing what had happened in the area during WW2 and the work of the members of the Resistance who had taken to the hills here to plan their actions against the German forces in the area. The signs are very well-placed & some have excerpts from testimonies given by people involved at the time – a clear reminder of the violence that took place in such a beautiful area a relatively short time ago. I’m sure that there will be more information on these routes in the Tourist Office at Sault, but unfortunately it was closed when we arrived so that will have to wait for another time! Anyway back to the ride, which continues up hill for several more kilometres, although the climbing isn’t arduous at all (contrary to what I had imagined). Eventually you come across the beautiful Chateau at Javon. 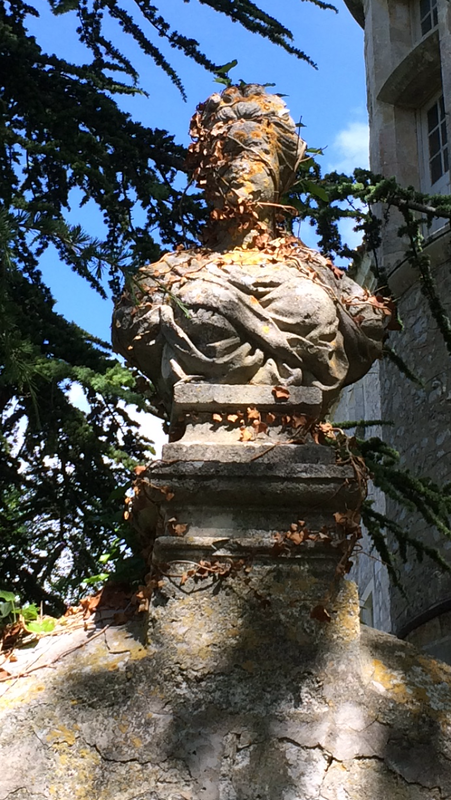 This stunning building (a Resistance base during the war) seems almost out of place next to the road, but although it’s not open to the public – its ancient stonework & shaded gardens, visible from the road are worth a quick stop. 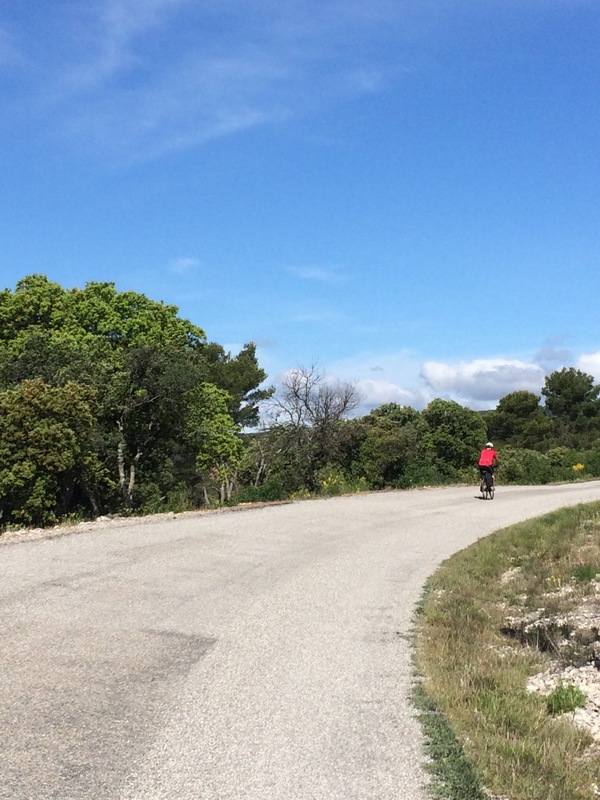 A short distance after Javon you leave the Luberon National Park and start to get your first view of ‘Le Géant de Provence’ Mont Ventoux, although yesterday it’s summit was shrouded in a blanket of cloud and I should imagine it was rather chilly at the top! 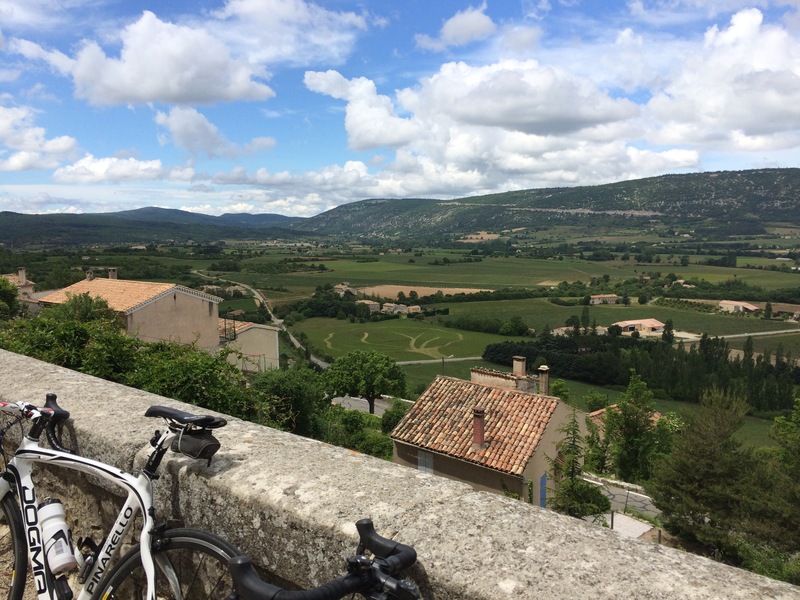 As you start to descend towards Sault (happily not as far as you have cycled up) there are incredible views of the Sault Valley, which in a few weeks time will turn purple with all the lavender flowers that fill the fields here. Even without that colour the view is stunning as you continue down crossing the River Croc, before a short climb, past a grand memorial to Resistance fighters into the town of Sault. We arrived as the bells struck 12, so headed straight for ‘La Promenade de Justin’ a restaurant right on the edge of the town with open views across to Ventoux. This is clearly the ‘go-to’ place for cyclists and when we arrived it was packed with people wearing every conceivable shade of Lycra, with bikes – many of which (according to my hubby & son) were the cycling equivalent of a Ferrari ! There was some serious bike envy going on at our table, especially as my poor hubby is currently riding a very tired, industrial, sit up and beg bike, as he has lent his favourite ‘Roubaix’ to our youngest whilst we’re here. 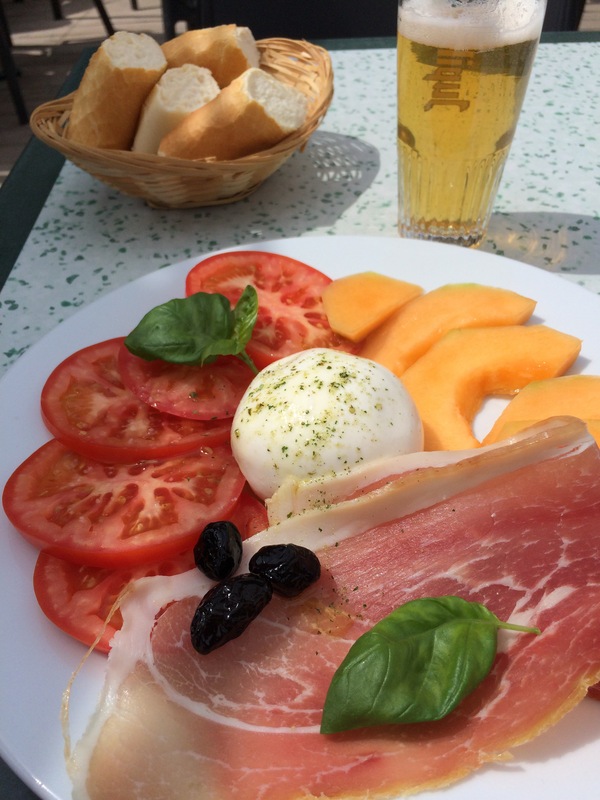 La Promenade is clearly set up for serving large numbers of people a satisfying & tasty meal, very quickly – a perfect spot, made even better when what appeared to be a pair of Vultures flew slowly across in front of the terrace. 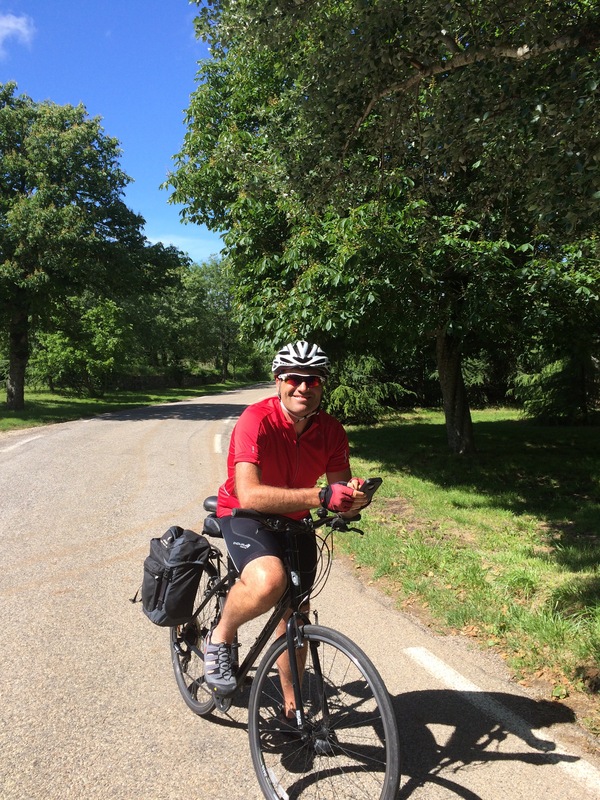 Nicely refreshed, all that was left was to cycle home, back the way we came, which meant a wonderful 20km downhill freewheel, with the temperature gradually increasing as we dropped back down into the Luberon Valley. Stopping again for a drink at La Platane in Saint Saturnin we were reminded of yet another reason why we like cycling, as we watched a parking attendant putting a ticket on a car that had been parked in the wrong place. This caused quite a lot of excitement at the bar with people rushing to move cars or borrow discs to put in the windscreen…. Certainly not something you have to worry about when you arrive by bike! So after 55 miles & a total (gentle) climb of 896 metres we arrived home and despite all my worries I’m already looking forward to doing the ride again – probably next time though I’ll do it on a Wednesday to tie in with the market in Sault (which according to the town sign has been running weekly since 1515). Until then though I’ll just keep exploring the other routes around here & see what else takes my fancy! Makes me want to overcome my trepidation of cycling upwards…once again, good on you! Hello! 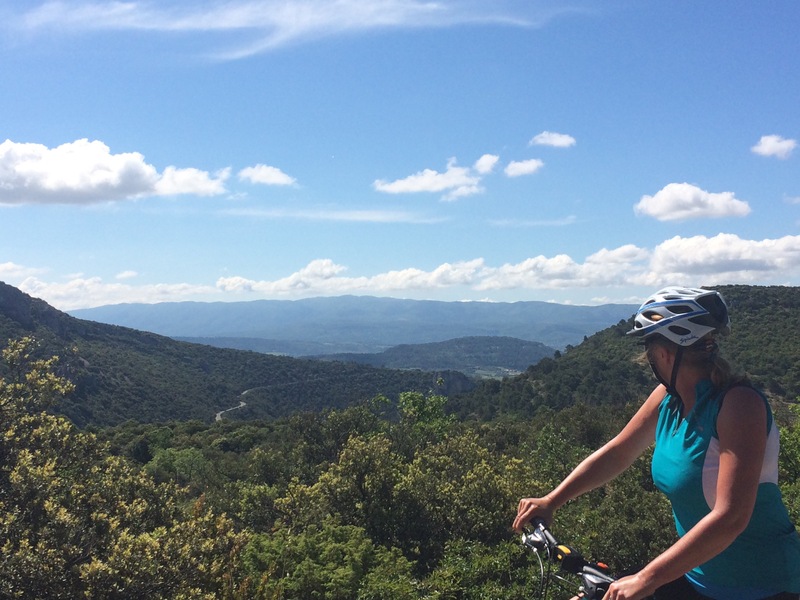 I have been enjoying your blog as my husband and I are cyclists (of a modest speed) and visit the Luberon every May. 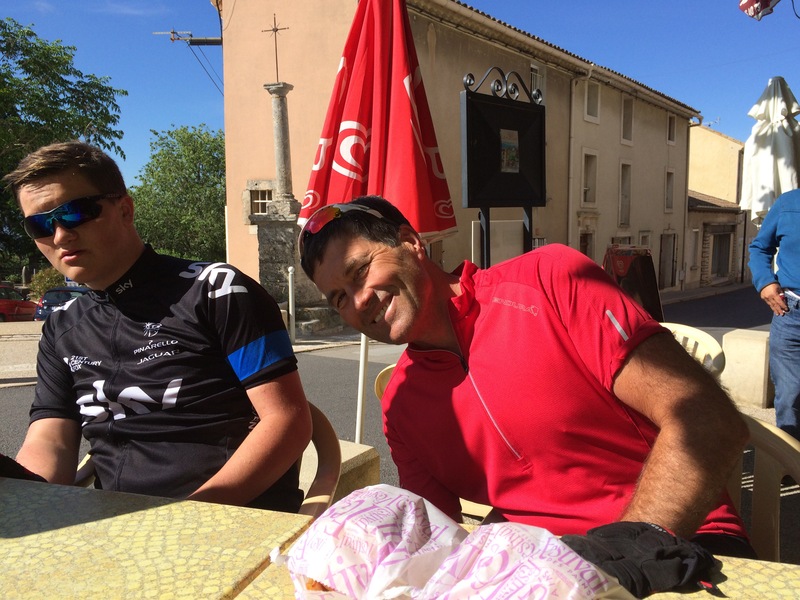 We attempted the ride up to Sault last year from St Saturnin des apt on a very hot day and gave up after a few km. We were on road 230. I am wondering if 943 is more gradual and a better choice? 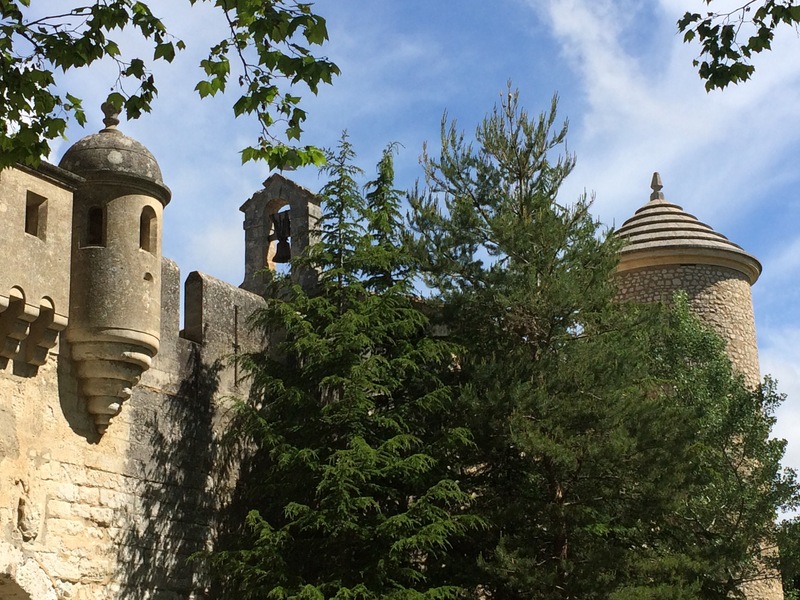 Btw today we did Cabrieres d’avignon-Lagnes-fontaines de Vaucluse (via 100a- fantastic! )-saumane-la roque sur pernes (a good climb there)- pernes les Fontaine – il sur la sorgue and back to Oppede where we are staying. Had never taken the 100a, it felt so remote. 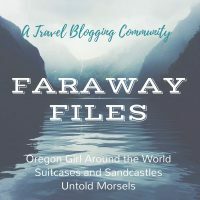 If you have not travelled that way I suggest you add it to your list. 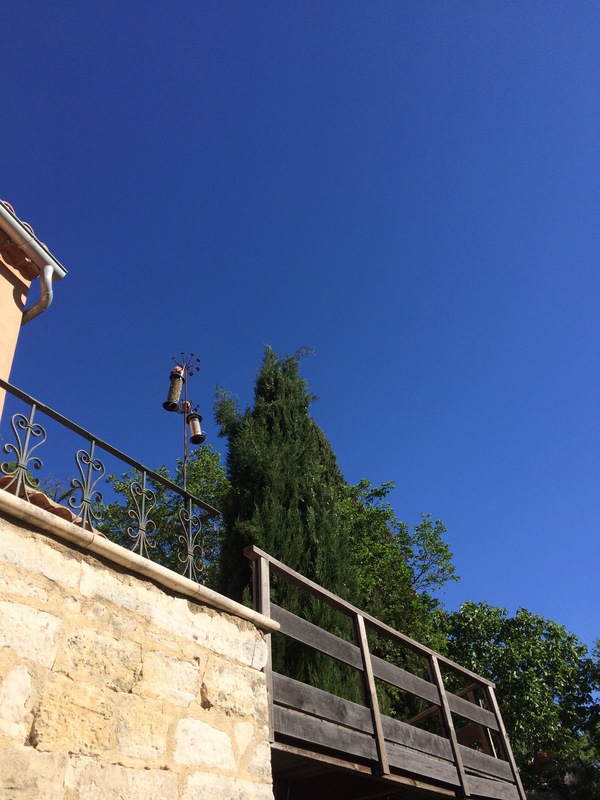 We love the route that takes us to Venasque via la roque sur pernes and then looping back thru gordes but save that for week 2 when we are stronger…thanks for letting us live the dream thru your blog !